While many types of cancer like breast, kidney, colon and lung cancer can metastasize or spread to the brain, primary brain cancer originates in brain cells. Usually, cancerous tissue forms of mass and develops the tumor, interfering with brain function that involves with normal body functions, memory, sensation and muscle control. The tumor can be formed with benign (non-cancerous) cells or malignant (cancer) cells. Statistics maintained by the American Cancer Society and National Cancer Institute reveal that more than 16,000 deaths occur every year in the U.S. due to brain cancer, and almost 24,000 new cases are diagnosed. Out of those, approximately 1 out of 20 cases involve brain tumors developed by hereditary genetic conditions including tuberous sclerosis, neurofibromatosis, and others. Each classification reflects a specific kind of abnormal cell growing in a normal brain. Grading provides the opportunity for the physician to better understand the level of concern on the aggressiveness of the brain cancer. Metastatic brain cancer involves tumor cells that originate in another area of the body and spread (metastasize) to the brain. While this is a secondary brain cancer, the metastasized cancer is often classified as a primary cancer type. As an example, metastatic lung, breast, kidney, skin (melanoma), and colon cancer can spread to other organs including into the brain through the body’s lymphatic system, through direct extension or through the bloodstream. These cancers are typically named after the organ or tissue where the cancer originated. Grade I – These benign tissues are similar in appearance to normal brain cells and slowly increase in size. Grade II – At this stage, the brain tumor has become malignant and appears as abnormal cells under the microscope. Grade III – At this advancing stage, the actively growing cells in the brain tumor have become malignant and appear as anaplastic (distinctly abnormal) in shape. Grade IV – At this late advanced age, the malignant brain tissue grows quickly, causing significant pressure to the brain, which can destroy healthy tissue. Occupations where the worker handles chemicals, jet fuel or hazardous oils, such as embalmers, oil refinery workers, and chemists. Family-Associated Brain Cancer where other family members have suffered from the disease. (However, no direct linkage or the passage of traits of brain tumor development through genetics from a parent to a child has been proven). Age is a significant risk factor where the increase of developing brain tumors rises exponentially in older adults. However, specific forms of brain tumors happen exclusively during a child’s younger years. Radiation Exposure is a significant problem that increases the potential risk of developing a brain tumor. There are factors that might or might not be the exact cause of developing brain cancer. These include cigarette smoking, HIV infection, radiation treatment to the head, and exposure to harmful environmental toxins. If any of the symptoms arise or remain persistent, it is crucial to see a doctor immediately. Performing a Neurological Examination – Performing a neurological examination including balance, coordination, hearing, vision, reflexes and strength can reveal specific clues that a portion of the brain might be affected or injured by a brain cancer or tumor. Imaging Testing – MRI (Magnetic Resonance Imaging) is an effective tool for diagnosing brain tumors. The doctor might inject dye into the patient’s vein prior to the imaging test to help evaluate the level of cancer and for planning an effective treatment. CT and PET Scans – Computerized tomography (CT) and positron emission tomography (PET) scans are highly effective in locating the spread of a brain tumor to other body organs and areas. The scans are often used on the lungs and other organs to assist in determining exactly where cancer initially started. Biopsies – The doctor can obtain a biopsy to collect abnormal tissue that will then be viewed by a professional under a microscope to determine if the cells are benign or cancerous. The information obtained through a biopsy is crucial in establishing a prognosis from the diagnosis to form an effective treatment. Brain Cancer Surgery – The surgeon may remove the tumor or obtain a tumor biopsy through surgical procedures. Drugs to Reduce Swelling – Decadron (dexamethasone) has been shown to be highly effective at relieving swelling in the brain caused by brain tumors and cancer cells. 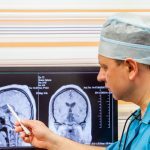 Excess Cerebral Spinal Fluid Elimination – Many individuals suffering from brain tumors build up excess cerebrospinal fluid around in the brain. The surgeon will install a shunt (plastic tube) in the area where the fluid collects and shunt the fluid to another area of the body under the skin. New procedures, surgeries, and clinical trials have become available in treating many forms of brain cancer to help increase survival rates.